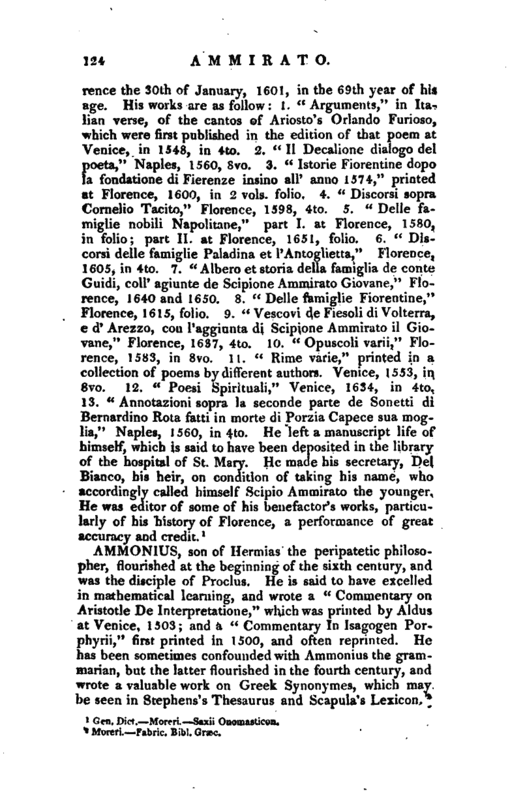 , an eminent historian, was born at Lucca, in the kingdom of Naples, the 27th of September 1531. He studied first at Poggiardo, afterwards at Brundusium; and, in 1547, he went to Naples, in order to go through a course of civil law. When he was at Barri with his father, he was deputed by that city to manage some affairs at Naples, which he executed with great success. Some time after, he determined to enter into the church, and was accordingly ordained by the bishop of Lucca, who conceived so high an esteem for him, as to give him a canonry in his church; but not meeting afterwards with the preferment he expected, he formed a design of going to Venice, and entering into the service of some ambassador, in order to visit the several courts of Europe. 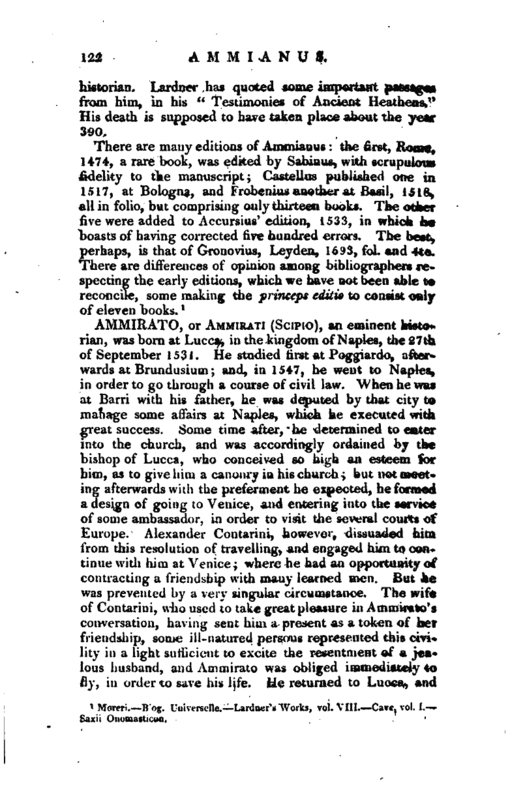 Alexander Contarini, however, dissuaded him from this resolution of travelling, and engaged him to continue with him at Venice; where he had an opportunity of contracting a friendship with many learned men. But he was prevented by a very singular circumstance. The wife of Contarini, who used to take great pleasure in Ammirato’s conversation, having sent him a present as a token of her friendship, some ill-natured persons represented this civility in a light sufficient to excite the resentment of a jealous husband, and Ammirato was obliged immediately to fly, in order to save his life. 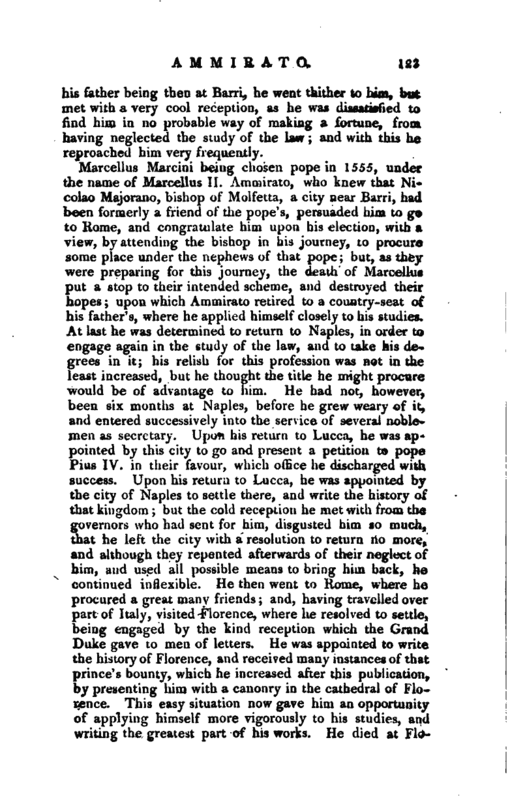 He returned to Lucca, and | his father being then at Barri, he went thither to him, but met with a very cool reception, as he was dissatisfied to find him in no probable way of making a fortune, from having neglected the study of the law; and with this he reproached him very frequently.